An interesting bunch of accomplishments worthy of some exploration. Expenses did not climb much, while net profit did. I've tracked, in previous years, the growth in capital expenses (presumably driving equity higher, which allows for higher regulated rates), and operational, or balance sheet expenses. For private companies, taxes would be an operating expense, but for Hydro One they are part of a mix involved in retiring debt. Payment in lieu of taxes (PIL) for 2012 are reported at a much lower level of $121 million in management's discussion and analysis (.pdf) than in the press release. While the net income Hydro One is reporting ($745 million) is a healthy record, the PIL remains far below levels paid up until 2008. Hydro One notes the PIL is forwarded to the black hole that is known as the Ontario Electricity Finance Corporation (OEFC) - the OEFC hasn't had an annual report since it delivered one in the summer of 2011. The OEFC's fiscal year ends on March 31st - so Hydro One is reporting on a period 9 months more current than the period the OEFC has not reported on. 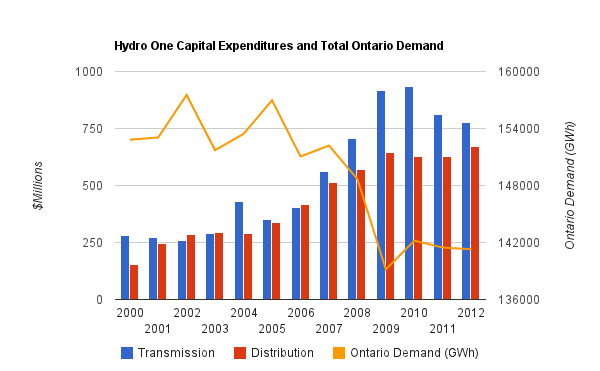 Hydro One does something of value. Regardless, the reason the OEFC is paralyzed may be a growing demand for accountability in reporting on the stranded debt. Stranded debt refers to debt a previous government did not consider backed by assets when it broke up the old Ontario Hydro late in the 1990's. The debt was largely to be retired by PIL (payments in lieu of taxes) and profits at Hydro One, and Ontario Power Generation, above those justified by the remaining equity. The amount that could not be recovered by those 2 revenue streams was known as the residual stranded debt and that would be paid for by the .7 cents/kWh debt retirement charge. The debt retirement charge has not been paying off any debt. That may simply be due to nobody paying attention until 2011's election season. However, it's also true that the lower the PIL, the more of the debt would be considered stranded. 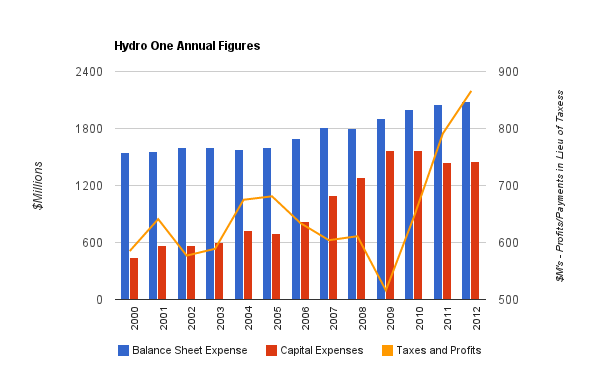 In 2002, Hydro One records show PIL of $233 million on net income of $344 million. In 2012, the records show PIL of $121 million on net income of $745 million. That's worthy of an award for exemplary corporate behaviour! Accordingly, in the circumstances of this case, the Board will not approve the overall Green Energy Plan on a conceptual, or any other basis. 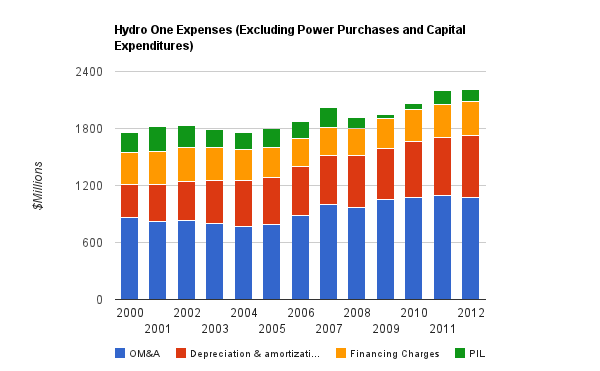 While spending remains off it's record levels of 2008 and 2009, the increase in Hydro One's asset valuation has accelerated. 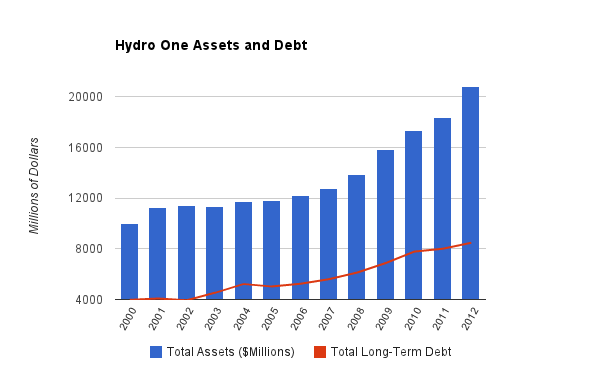 Despite the completion of the Bruce-Milton transmission line starting revenues from the $1.75 billion project, Hydro One continued to expand long-term debt. The reporting shows the increase in long-term debt being about half the growth in asset value. Good news, if the asset value is trusted. note: The annual figures change from year to year. For instance, in the 2011 reporting Total assets were reported as $18,368 million, but in 2012's reporting the figure provided in comparing to 2011 is a considerably higher $18,836 million.